World bicycle travelers and authors of Bike Touring Basics, Friedel and Andrew Grant, describe their book in the introduction as "a compact and inspiring introduction to the world of bike touring, from the planning stage through to the equipment you might need to get started." They state the book's purpose even more concisely on the title page: "A mini guide to bicycle touring, for people planning a first exploration of the world by pedal power." These words accurately describe the Grants' tightly yet warmly written eBook on the what-to's and how-to's of the bike touring world. 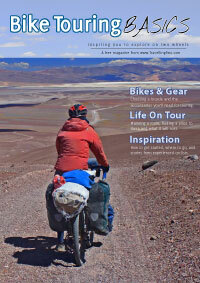 The front cover indicates Bike Touring Basics contains information on "bikes and gear," "life on tour," and "inspiration." Many chapters begin with a quotation from some experienced world bicycle traveler. For instance, the chapter "Why Go Bike Touring" begins with a quote by Rebeca Jensen, a portion of which is as follows: "Bicycle touring is heightened awareness. It's the difference between microwaving and cooking a meal from scratch. It's the difference between standing awe-struck in front of a painting and clicking past it on the internet." All these quotations are linked to sites on the web, and many more avid bicyclists who helped create the book are also listed, so the book becomes a source or index for a much wider world of experienced bike touring that the Grants have connected with. A free PDF version of the book is available at the Grants' website, TwoTravelling.com, but it is mentioned in the introduction to the e-Book that the PDF is not as full, lacking some information, links, and photos. The image on the cover, for instance, "was taken at 4,500 meters on the Puna de Atacama in northern Chile." It was part of a multi-month bike tour in South America, by Harriet and Neil Pike. The touring experience of the Grants, coupled with their interaction with the world bike-touring community, provide a powerful sense of credibility to the book. The contents of the book range from the motivation of why to tour, to costs, route planning, on whether to sleep in hostels or to "wild" camp, equipment (gear), buying a bike, and loading up the bike. Equipment covered includes a balance of American and European gear. The Grants are Canadian, have lived in England, and are now living in the Netherlands, "a cycling paradise." I found this book very readable--easy to follow and a nice balance of heart and intellect, satisfying both. I'll let the authors finish up this review. ". . . bike touring really is something anyone can do. You don't need to be super fit or below some arbitrary age barrier. You don't even need to know a lot about bike touring and you certainly don't need a fancy bike." "Finally if you remember nothing else then remember this: people of all types and descriptions are out there right now, pedaling across their countries, continents and even the world. You can too, and you'll have the time of your life along the way." They go on to mention that it doesn't hurt, though, to gain a little knowledge before striking out. Bike Touring Basics is an enjoyable and inspiring place to gain that knowledge. Here is a link to a YouTube video on the Grants touring with their five-month-old son. They seem like nice folks.